FRANKLIN, Mass. – Timing is everything, especially in the playoffs. Unfortunately for the seventh-seeded Franklin boys soccer team, it was the 10th-seeded BC High Eagles that were on the right end of things. 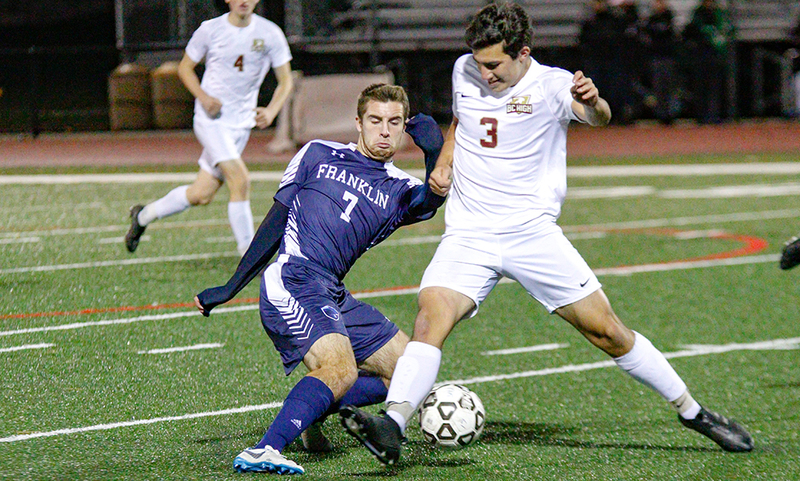 The Eagles scored a goal in the final seconds of the first half to level the match, and then just minutes after Franklin had a golden chance, BC High scored the go-ahead goal and earned a 2-1 decision on the road at Pisini Field. While BC High came out with all the energy, it was Franklin that struck first, opening the scoring just over 15 minutes into the contest. In just their second foray into the attacking third, the Panthers cashed in. Junior Lucas Moura collected a clearance attempt and alertly played the ball in behind a pair of defenders. Senior Ethan Bowenmade the run onto the ball, getting a touch to the ball just as the BC High keeper came sliding out. The keeper got a piece of the shot but not enough as Bowen’s touch found the back of the net and gave Franklin a 1-0 lead in the 18th minute. After the Eagles had controlled the game, the goal from the Panthers seemed to instill some confidence and the game equaled out in terms of possession and chances as halftime approached. In fact, best chance over the next 20 minutes belonged to the host Panthers. In the 29th minute, senior Nick Barry switched the field of play with a nice cross to an open Tim Duval but his shot from atop the area went over the bar. Just as it looked liked the Panthers would take a lead into the halftime break, the Eagles leveled the match. Off a corner kick in the final minute, BC High had its initial bid parried away by junior keeper Jack Rudolph but the rebound fell to the feet of Eagles’ senior Luke Reid and he buried the loose ball to knot the score. While BC High gained some momentum at the break, the Panthers quickly reasserted themselves in the game, having their best three chances of the second half in the first 20 minutes of the frame. In the 45th minute, Duval found junior Donny Tappin and his first touch put him through a pair of defenders but his off balance bid was over the bar. Two minutes alter, the Panthers continued to apply the pressure as Barry ripped a hard cross that forced a diving save in the area from the keeper to prevent the ball from finding a recipient. And then in the 58th minute, Franklin had its best chance to take the lead back. Duval battled his way past a defender on a long ball from Nitin Chaudhury to get into the area. He beat another defender and cut past the oncoming keeper to have a look at the net but his bid with the outside of his foot rolled wide of the frame. The Panthers found themselves on the end of an unlucky call just minutes later after the ref in front of the play allowed the play to continue, but the official on the opposite side of the field called Franklin for a foul. The Eagles sent the free kick into the area and a scrum ensued before Anatoliy Berezyuk got the final touch on it for a 2-1 lead. 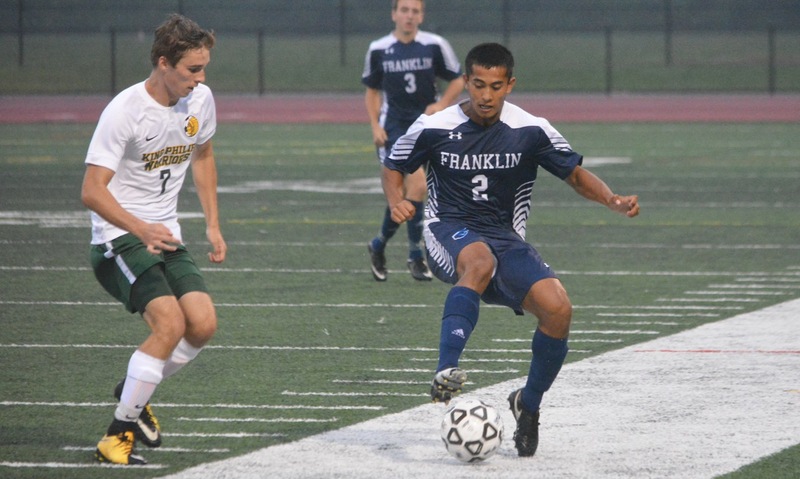 Franklin boys soccer made a push in the final minutes, pushing all players forward in search of services from junior Sam Stowell, but the Panthers couldn’t create a chance on target. The Panthers finish the season 10-7-2.